This is my Seven Nations fan page. 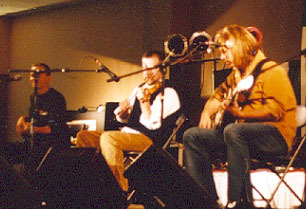 Seven Nations is a celtic rock group of five. For those who follow the band, these pics are way out of date, as the lineup has changed. Just checked their website, couldn't find a lineup list. Anyway, they are a great band. 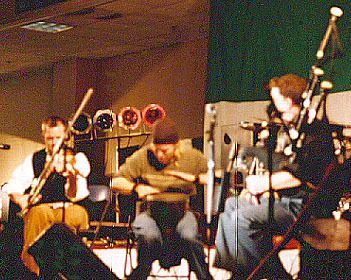 These photos are from February 2004, at the Scottish & Irish Music Festival at King of Prussia, PA.
At left: I finally got a picture of Crisco, who is seen here with Scott and Dan, doing some primitive celtic drumming, fiddling and piping. 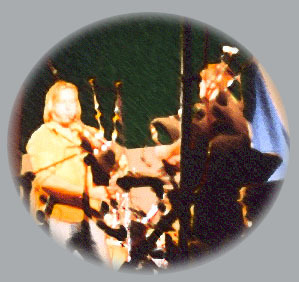 Below: Kirk and Scott dueling bagpipes. Above: Struby on bass guitar, Dan on fiddle, and Kirk on guitar - this was an unplugged session in the afternoon. 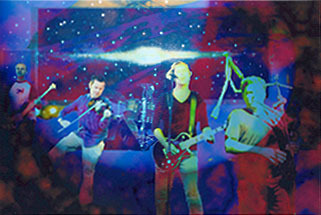 This is a computer image that I made of Seven Nations back when it was Kirk, Struby, Scott, Dan and Ashton. They are "under the milky way."